The Dairy Youth Recognition Auction was established as a means of recognizing accomplishments of outstanding Green County Dairy Youth. The youth participate in an auction, where a symbol of the sale participant’s achievements is offered for sale. 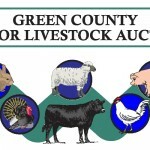 Each auction participant receives 50% of his/her bid price in the form of a savings bond, while the remaining 50% goes into the Dairy Youth Recognition Auction Fund to cover auction related expenses and educational scholarships for Green County Dairy Project 4-H and FFA youth. This year’s Dairy Youth Auction is being held on Sunday, July 22nd in coordination with the Cheese Auction in the Hospitality Tent at the Green County Fair, starting at 1:00 pm. For a complete list of the youth who qualified to participate, please print the 2018 4H Dairy Auction Program. Green County 4-H Dairy Youth WIN!